Maria Antoinetta Guiseppa di Borbone, Principessa delle Due Sicilie was born on 16 March 1851 at Naples, ItalyG.2 She was the daughter of Francesco di Paola di Borbone, Comte de Trapani and Marie Isabelle Erzherzogin von Österreich.2 She married Alfonso Maria Guiseppe di Borbone, Principe di Borbone delle Due Sicilie, son of Ferdinando II di Borbone, Re delle Due Sicilie and Maria Theresia Isabella Erzherzogin von Österreich, on 8 June 1868 at Rome, ItalyG.2 She died on 12 September 1918 at age 67 at Freiburg-im-Breisgau, GermanyG.2 She was also reported to have died on 12 September 1938. Count Grigorii Aleksandrovich Strogonov was born on 16 June 1824. 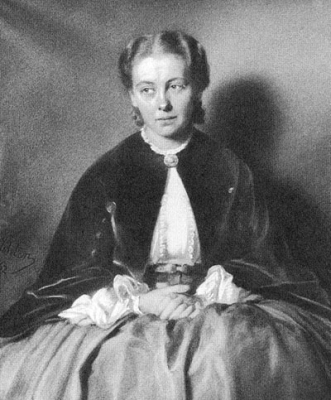 He married Mariya Nikolaievna Romanov, Grand Duchess of Russia, daughter of Nikolai I Pavlovich Romanov, Tsar of Russia and Friederike Luise Charlotte Wilhelmine Prinzessin von Preußen, on 4 November 1856. He died on 13 March 1879 at age 54. [S12] C. Arnold McNaughton, The Book of Kings: A Royal Genealogy, in 3 volumes (London, U.K.: Garnstone Press, 1973), volume 1, page 296. Hereinafter cited as The Book of Kings. Elizabeta Nikolaievna Romanov, Grand Duchess of Russia was born on 7 June 1826 [26 May 1826 O.S. ].1 She was the daughter of Nikolai I Pavlovich Romanov, Tsar of Russia and Friederike Luise Charlotte Wilhelmine Prinzessin von Preußen.1 She died, young. [S12] C. Arnold McNaughton, The Book of Kings, volume 1, page 306.